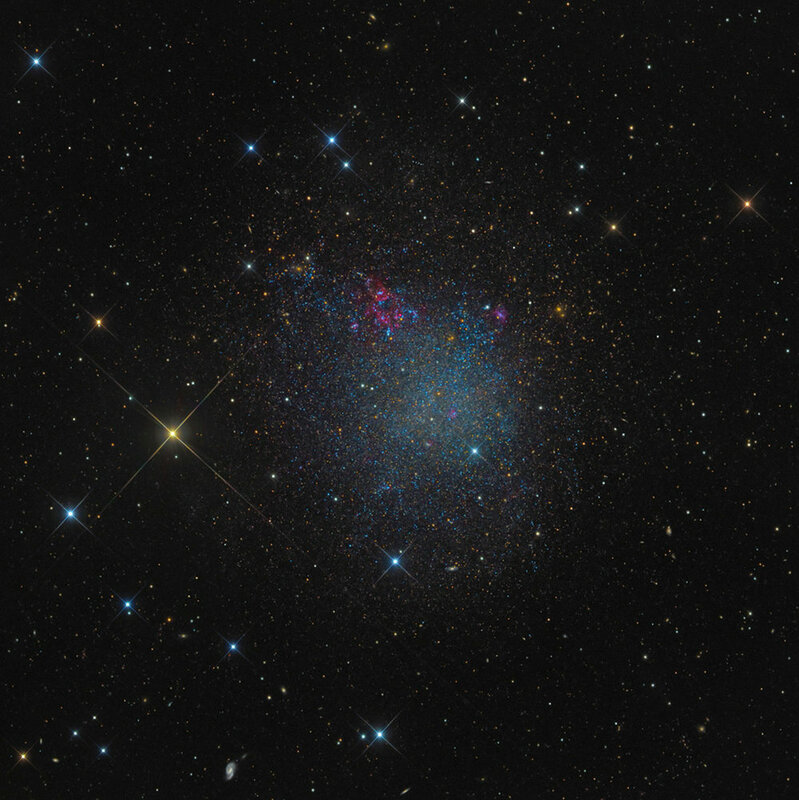 IC 1613 (Caldwell 51) is a dwarf irregular galaxy located in the constellation Cetus and was discovered by Max Wolf in 1906. This galaxy is a member of the Local Group of galaxies and has a morphological classification of IBm (Irregular Barred - Magellanic type). Irregular galaxies are those that don't fit into the Hubble sequence of galaxy classification and often have chaotic structure, lack spiral arms and no nuclear bulge. It's believed that these galaxies are shaped so because of gravitational influences from passing galaxies or larger neighboring ones. IC1613 has a very low surface brightness and so little dust that background galaxies can been seen behind it in this image. The center has a visible bar like structure and overall has several star forming regions as evident by the red HIII regions surrounding hot blue O/B stars. Star ages range from 20 million to 10 billion years old.